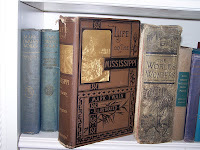 In our bookshelf in our Florida home is a copy of Mark Twain’s book “Life on the Mississippi” published in 1883. On the inside cover there is a label indicating that the book was part of the “H.C. Spaulding Library”. Henry C. Spaulding was my great grandfather, father of my grandmother, Helen Spaulding (Baker). His Mark Twain book and its label inspired this family history chapter on the Spaulding family. The Spaulding (Spalding) surname appears quite early in English history. The name was derived from the ancient Saxon town of Spalding in Lincolnshire, England and the name Spalding literally means in Latin: “the tribe who live at the shoulder (of marsh land)” which is an apt description of the land occupied by the early Spalding tribes. The first written record mentioning Spalding was in a Charter issued in 716 AD. In the Doomsday Book, a census prepared for William the Conqueror after 1066, Spalding and the Spalding Manor is recorded (then spelled “Spallinge”). The first referenced Spalding individual was a Ralph de Spalding who was granted a property deed in 1273. In 1327, a William de Spalding, a wool merchant was elected to Parliament. By the time of the birth on September 13, 1596 of Edward Spalding, the first Spalding to emigrate to the New World, descendants of the earliest Spalding tribe had been living in England for over 600 years. Early in the spring of 1619 Edward Spaulding boarded a ship in London that sailed for the Jamestown Colony in Virginia. On board the ship with Edward was Sir George Yeardly, the new governor of the Virginia Colony and around 100 other settlers mostly male. To pay the cost of his voyage, Edward signed himself on as an indentured servant, an obligation that would require him to provide seven years free service to the Virginia Company who had sponsored the voyage and the Jamestown colony. Exactly why Edward elected to risk his life on the voyage and the hardships in the New World is unknown. He did not fit the typical profile of an indentured servant described by one source as composed primarily of “orphaned apprentices.” Men were being sent to the new colony to provide the labor to produce goods that could then be shipped back to England to help pay for the colony’s expenses and provide profits to the investors. While Edward’s mother Anne had died of child birth in 1603, his father Willfred Spalding, had remarried and was still alive at the age of 49 and working in the cloth trade in Cornhill near the town of Spalding in Lincolnshire, England. Perhaps Edward was an adventurer or maybe he just felt down on his luck. Either way he was only 23 years and he must have considered trying his luck in the New World to be a viable option. Edward Spalding disembarked in Jamestown in May of 1619 approximately one year before the Pilgrims landed at Plymouth Rock. Even at this early date, Jamestown was a fairly well developed colony. The original Virginia Company explorers had landed on Jamestown Island on the banks of the James River about 60 miles from the mouth of the Chesapeake Bay on May 14, 1607. Much like the early years in Plymouth Colony, the population of Jamestown was initially decimated by disease, famine, and continuing attacks by Indians. After a particularly bad winter in 1609 described in accounts as a “starving time,” the ranks of the original 214 settlers had been reduced to only 60. Fortunately and as a result of some excellent leadership, the Jamestown colony survived and even to some extent prospered. In 1617 the tobacco plant was introduced and due to the favorable soil and climate conditions in Virginia, the plant was easily grown. Soon almost everyone was planting tobacco and within a few years the demand for tobacco in England had increased dramatically. By the time Edward Spalding arrived, there were more than 1,000 colonists living and working in Jamestown. Most of them were males which meant that the population growth of the colony depended almost entirely on new immigration. Slavery was introduced in Jamestown in the year of 1620. In 1620, eleven ships arrived carrying 1,260 new settlers including married couples with children and 150 single women. As would be expected, the demand for the single women by the single men greatly outstripped the supply. The colony’s leaders perhaps to cool the demand, elected to sell the women by charging a fee of 120 pounds of tobacco to acquire a new wife. It is recorded that Edward Spalding elected to obtain a wife in this manner from the selection of women who were described as “agreeable persons, young and incorrupt.” This would seem to be a most helpful description. Apparently the union was successful for in 1623 it is further recorded in the “Virginia Colonist Record” in a List of the Living in the “Corporation” that Edward Spalding with his wife, son and daughter lived in the Jamestown colony. Life in Jamestown was still not idyllic. In 1622, an Indian uprising resulted in the death of over 300 colonists, and disease was still taking an enormous toil on the population. One contemporary commentary on Edward Spalding stated that he finally departed Jamestown “after losing two young families.” Whether or not this is true can not be confirmed, however it does appear that when he relocated to Massachusetts sometime in the late 1620s he did so without children and possibly without a wife. No doubt conditions in Jamestown were too much for him to bare. By 1627 he had completed the terms of his indentureship and he must have concluded that there were better opportunities in Massachusetts. Whether or not Edward’s marriage to Margaret Elliot took place in Virginia or in Massachusetts we do not know. By 1630 his name first appeared in the Braintree (Quincy), Massachusetts’ public records and on November 16, 1633 it is recorded that a son was born to Edward and Margaret. Their son John, is our great (x9) grandfather and the first Spalding born in America who survived to adulthood, and had children. Edward and Margaret were to have two sons and a daughter before Margaret’s death in August of 1640. In May of 1640 Edward was made a “freeman” which meant that he was a member of an established church and therefore could be chosen a magistrate or serve on a jury. In August of 1640 Edward remarried and was to have with his new wife Rachel, six additional children. In October 1645, Edward with nineteen other petitioners were granted 10,000 acres of land to establish the town of Chelmsford, Massachusetts. In 1654 and 1656, and again in 1660 and 1661 he was chosen a selectman in Chelmsford. He is also listed in the Chelmsford records as being a surveyor in 1663 and again in 1663. Edward Spalding died on February 26, 1670 and he is buried in Chelmsford, the town that he helped establish many years earlier. The great (x5) grandson of Edward Spalding was my great-great-great grandfather Henry Clinton Spaulding. The Spaulding family had moved in the course of the seven generations following Edward from Chelmsford, Massachusetts to Connecticut, then to Vermont, and finally to Elmira, New York. On December 30, 1840, Henry Clinton Spaulding married Clara A. Wisner. He was 28 years old; she was 18. Together they had three children: Charles Henry Spaulding, my great-great grandfather, born in 1841, Alice Wisner Spaulding born in 1847, and Clara Louise Spaulding born in 1849. Henry operated a successful lumber business in Elmira and by the standards of the day for Elmira was considered a wealthy businessman. The family lived in a large Victorian home in an upscale neighborhood and as befitting their status they employed live-in servants to help with their daily needs. One of Alice and Clara Spaulding’s close neighborhood friends when they were young was Olivia (Livy) Langdon, daughter of Olivia and Jervis Langdon. Jervis Langdon owned coal mines in Pennsylvania and operated coal distribution businesses in several cities. The Langdons were a leading family in Elmira. They had wealth and a splendid mansion that occupied including its grounds an entire city block. The young girls would play parlor games together, read books to each other, and participate in other activities one might expect from well-bred girls in this Victorian age. On the other hand, Livy’s younger brother, Charlie, was less restrained and was considered by his parents a “lackluster student and incipient drunkard.” As a consequence, his parents sent him on a European cruise hoping that it would provide him a degree of education and curb his drinking. While on the cruise, Charlie formed a friendship with a young reporter, Samuel Clemens, who using the pseudonym of Mark Twain, was sending dispatches back to his newspaper in America reporting on his adventures. Charlie apparently showed a photograph of his sister Livy to his friend, and according to Mark Train in his later years, he fell in love with Livy immediately. After a long courtship, Samuel Clemens and Olivia Langdon were married on February 2, 1870. He was 35, she was 25. The large wedding held at the Langdon home was attended by the entire Spaulding family. Clara Spaulding was to remain a close friend of Livy and Sam Clemens for the rest of their lives. Initially, the Clemens moved to Buffalo, New York where they owned a home and a newspaper business that had been purchased as a wedding gift for Sa m and Livy by her parents. When Livy got seriously ill following the birth of her first son in November 1870, it was Clara Spaulding who made the trip from Elmira to Buffalo to help her friend in her time of need. Jervis Langdon died in late 1870 leaving his daughter a wealthy woman. In May of 1873, the Clemens traveling with their second child (the first had died), and Clara Spaulding, embarked on a ship bound for England. They remained in England until November of the same year. While in England, Livy conceived a third child, a daughter, who was born in June 1874, whom they named Clara, after our great-great aunt, Clara Spaulding. The adjacent photograph was probably taken around 1873. The women holding the baby is Clara Spaulding. Olivia Clemens is sitting to her left and Samuel Clemens (Mark Twain) is standing in the background. On November 6, 1877, Alice Spaulding, Clara’s sister married Charles E. Rapelea. Along with relatives and many other quests at their wedding were Mr. and Mrs. Samuel Clemens. As an aside, Charles Rapelea was undoubtedly a descendant of Joris Rapelje who came to the New World with his wife in 1624, (and the subject of another chapter.) 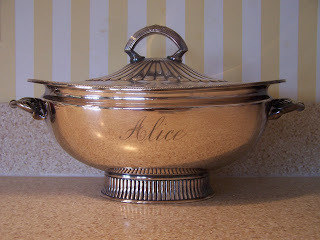 The silver serving bowl engraved with the name “Alice” shown in the adjacent photograph, may have been a wedding gift to the new bridal couple. It is fun to speculate that the gift may have been given to the new couple by Samuel Clemens and his wife. The silver bowl is presently at our home in Florida. On April 11, 1878, Sam and Livy, their two children, and their close friend, Clara Spaulding, departed once again on a ship bound for Europe. This time they traveled for sixteen months visiting Germany, Switzerland, Italy, France, Belgium, Netherlands, and England, finally returning home in late August of 1879. On September 2, 1886 at the home of her parents, Henry “Harry” and Clarissa Spaulding, Clara Spaulding married John B. Stanchfield, a young Elmira attorney. She was 37 years old when she married. He husband was seven years her junior. 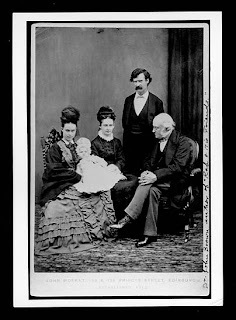 Not surprisingly, Mr. and Mrs. Samuel Clemens attended the wedding along with their two daughters, Susan and Clara. Clara and her new husband were to remain close friends of the Clemens for the rest of their lives. In fact, John Stanchfield was to occasionally represent Samuel Clemens in certain legal matters almost up to the year of Samuel's death in 1910. In the 1910 U.S. Census the Stanchfields were found living on Pine Street in New York City. Occupying their home were John and Clara, their two children, Alice, age 22 and John Jr., age 20, and their six servants. Obviously John had built a successful legal practice. Clara never lost her love of traveling to Europe. Her name and her husband’s name are included in passenger lists on ships arriving from England in years 1913, 1914, and 1920. Her husband died in 1921. Even following his death she continued to visit Europe each summer as she is found on passenger lists in the years 1924, 1926, 1929, and 1931. She was 82 years old when she made her last voyage. Olivia Langdon Clemens died in 1902 while vacationing in Europe. Samuel Clemens passed away on April 21, 1910. They are buried in the Langdon Family Plot in the Woodlawn Cemetery in Elmira, New York. Less than 100 yards away from the Clemens in the Woodland Cemetery are buried many members of the Spalding family including my great-great grandparents Charles Henry Spaulding and his wife Mary Catherine Sly, who by the way is the great granddaughter of Lebbeus Hammond who is covered in an earlier family history chapter. Also buried with the Spaulding family is my grandmother, Helen Spaulding and her husband, my grandfather, Charles S. Baker. Mark Twain and his wife lived in Buffalo, New York until 1871 and after selling their Buffalo home and newspaper business, they moved to a new home in Hartford, Connecticut where they were to reside for the remainder of their lives. Twain complained however, that he was constantly interrupted in his writing at their Hartford home. Fortunately, they were invited by Livy’s older sister, Susan, to spend their summers at her home in Elmira, New York which they were to do each year for almost twenty years. It was at this summer retreat in Elmira where Mark Twain penned his most famous books including The Adventures of Tom Sawyer, Adventures of Huckleberry Finn, and in 1883, Life on the Mississippi. Clara Spaulding’s nephew, Henry C. Spaulding, my great grandfather purchased or was gifted a first e dition copy of Life on the Mississippi probably in 1883. He was 20 years old at the time and he would have undoubtedly met the Clemens. When Henry died, the book was passed down to his daughter, my grandmother, Helen Spaulding (photograph). She married my grandfather Charles S. Baker and when he died, while living with my parents at their home on Lewiston Road in Niagara Falls, the book was passed down to my father. I was always fascinated by all of the old books on the shelves in our family home on Lewiston Road. It seemed to me at the time in the early 1950s, that most of these old books were never touched and never read. I remember asking my father why all the old books. He told me that many of the books had belonged to his parents and his grandparents and that when they had died they passed to him. My father was especially proud of what he believed was a first edition copy of Mark Twain’s “Life on the Mississippi.” He went on to tell me that Mark Twain, whose real name was Samuel L. Clemens, lived for a time in Elmira, New York and knew some of our relatives. I was only twelve or so at the time of our conversation and none of this meant much to me. I doubt I knew the meaning of a “first edition.” Nevertheless, I never forgot this conversation. Forty-five years later, and a year or so before my father’s death, I found Mark Twain’s old book on one of the bookshelves in my father’s Lewiston, New York home and I reminded my father of our conversation many years earlier. Once again he repeated that he thought the book was a first edition. We both agreed however, that if it was a first edition, it probably was not worth much, as the book was in very bad shape. The binding was broken and the pages were loose. I told him that I liked old books and therefore was pleased when he offered it to me. I then carefully packed the book in my suitcase and several days later proudly placed the old book on our bookshelf in our Savannah home. In November of 2004, I came across an advertisement in the Fort Myers’ newspaper posted by a company that claimed to specialize in restoring old books. I immediately thought of Mark Twain’s “Life on the Mississippi”. A day later I meet with Mr. John A. Ravenhill, President of Davall & Chown in his small cluttered office in downtown Fort Myers, Florida. Mr. Ravenhill was an Englishman, 67 years old, who according to him had been binding and restoring books since he was fourteen years old. He showed me some of his book restoration work, and it was truly wonderful. The man had the skills. I then showed him the copy of “Life on the Mississippi.” While the inside cover of the book stated that it was printed and published in 1883 by James R. Osgood and Company and further stated “Copyright, 1883, by Samuel L. Clemens,” it also stated that it was “Copyright, 1874 and 1875, by H.O. Houghton and Company.” It was Mr. Ravenhill’s opinion that the book was not a first edition as obviously the Houghton published book preceded the Osgood publication. This was of course, very disappointing but I was even more disappointed by Mr. Ravenhill’s quotation of $375.00 to restore the book. I left his office still carrying the book. I was determined upon returning home from my visit with Mr.Havenhill to do a little more research on the internet before giving up entirely on my copy of “Life on the Mississippi.” What I learned after searching the web for several hours confirmed my father’s believe that his copy of the book was indeed a first edition, at least a first edition of the American publication of the book. The book was published five days early in London, however the American publication by James R. Osgood and Company is generally recognized as the more valuable “First Edition” despite the fact that there were fewer copies of the book printed in England. I also learned that parts of the book were published in a seven part serial in the Atlantic Monthly, a magazine published by H.O. Houghton & Company. This explains the 1874 and 1875 copyright dates printed in the 1883 James R. Osgood & Company copy of the book. It also turns out that H.O. Houghton & Company and James R. Osgood and Company were one and the same company as the two companies had merged in 1878. It is very difficult to determine the value of our copy of Mark Twain’s “Life on the Mississippi.” There are many first edition copies of the book for sale on the internet including four copies on eBay (as of November 7, 2004.) The value of the book depends on its condition and whether or not it was the first printing (“first stage”) of the book or subsequent printings. It turns out that our copy of the book was the first printing of the first edition of the book, a fact that greatly increases its value. This was determined by noting that the illustration of the hotel shown on page 443 of the book was mislabeled as the St. Louis Hotel. In the second printing this was corrected to list the hotel as the St Charles Hotel. Furthermore, in the first printing of the first edition the illustration of Mark Twain’s head on page 441 was shown surrounded in flames. The flames were deleted in the second and subsequent printings. Our copy lists the hotel as the St Louis Hotel and shows the flames surrounding the illustration of Mark Twain. It does appear that the retail value of the book even in its present condition could be at least $400.00. The most valuable copy I found listed on the internet was selling for $3,500. The value of the book however, is a truly secondary consideration as to whether or not the book is worth restoring. The fact that our ancestors were friends of Samuel Clemens and his wife and the fact that the book was written by Clemens while residing in Elmira, adds a sentimental value to our first edition, first stage (print) of “Life on the Mississippi that is far more to our family than its monetary value. As of December 24, 2006, the book has not been restored. Thanks so much for sharing the Spaulding family history! !.My great grandparents were Clara Louise Spaulding and John Barry Stanchfield. That is amazing I am literally in Spalding England learning about my family history. And this I a great piece that I did not know about. A funny coincidence: my grandmother, Jessie E. Baker of Bath, Maine, married my grandfather, Harry Ashton Spaulding of North Anson, Maine, in 1906. My father, Edwin Baker Spaulding, was born in 1908, and his parents divorced in 1914. Thank you for your detailed account of Edward Spalding's arrival in Jamestown. I thought he was on the first Jamestown Settlement and now I understand his arrival. I never heard of the Spalding family connection to the Samuel Clemens family. I am Mary Jane Spalding Gorski of Traverse City Michigan, great granddaughter of Jonathan Spalding who originally came from New York, then to Oakland Michigan and then settled in Traverse City Michigan around 1870. My grandfather moved to Grand Rapids as a young man, my father was born and raised in Ludington and I was born and raised in the Detroit area but moved to Traverse City as a young woman and much later learned I could consider myself a Traverse City pioneer. Thank you for this history. It has provided a lot of information and I have enjoyed reading it. My father was Samuel Joseph Spaulding 1/23/1916 - 8/19/1984), he married Margaret Croak 8/14/1920 - 6/16/1989) and his Father was Joseph Alexander Spaulding (1878 - 1925), married Anna Katherine McCullough (1879 = 1942) his Father was Bernard Spaulding (1839 = 1900+) born in Enniskillen, N. Ireland) and he married Mary ? I can find no other mention of this line of the Spaulding family before that, I wish I could. My family is descended from Edward's youngest son Andrew. We live in Virginia today. Hello to all my distant cousins. I am also a descendant of Edward's youngest son Andrew. We live in the Seattle area today. As children we knew we had the Spalding book, but it was not something we understood much about other than it had to do with our family lineage. It has been fascinating to dig into it now. What is the source material re Edward being an indentured servant,?